Find details on our Hidden Gems page. Georgia River Network’s annual Paddle Georgia event is crossing state borders in 2019 as we celebrate our 15th year of serving up week-long canoe/kayak/paddleboard adventures. 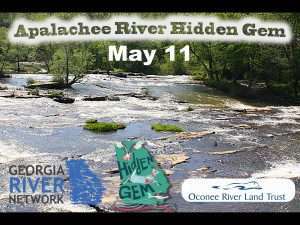 Paddle Georgia 2019 will take place June 15-21 over 92 miles of the Withlacoochee and Suwannee rivers in far south Georgia and north Florida. It marks the first time that the annual event has crossed state boundaries. Of Georgia’s 14 major river basins, half flow into neighboring states, including the Suwannee. Georgia has been embroiled in a 30-year dispute with Florida and Alabama over the use of the Chattahoochee, Flint and Apalachicola rivers. Paddle Georgia 2019 will begin on the Little River near Valdosta. 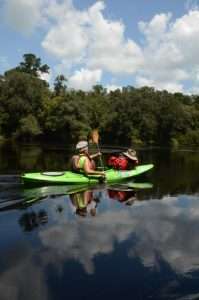 After launching, paddlers will immediately meet the Withlacoochee River and spend five days following its winding course through Georgia and into Florida. The final two days of the trip will descend the Suwannee River in Florida, ending June 21 near Mayo. Both the Withlacoochee and Suwannee are known for the breathtakingly cold and scenic blue hole springs that feed into the blackwater rivers. Along the paddling route, participants will have the opportunity to dip their toes—or their whole bodies—in no less than a dozen of these springs that boil up through karst limestone from the Floridan aquifer. Among the highlights will be Madison Blue Springs and Lafayette Blue Spring state parks in Florida. And, though the Withlacoochee travels through flat land, the river does offer up some shoals along its route and is flanked in places by high limestone bluffs. 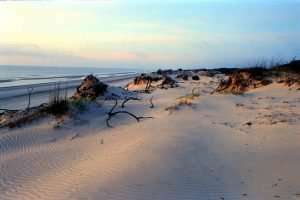 The Suwannee, which has its beginning in Georgia’s Okefenokee Swamp, is also characterized by limestone bluffs. The route will take participants near the towns of Valdosta, Quitman and Lake Park, Georgia as well as Jennings, Madison, Live Oak and Mayo, Florida. On the river by day, the paddlers will camp at nearby facilities where catered meals, educational programs, and entertainment will be served up nightly. In Florida, the group plans to camp at Advent Christian Village, a retirement community and retreat facility on the banks of the Suwannee. While many participants will tent camp, others will take advantage of the village’s hotel rooms and hostel-style sleeping facilities. We are still working to finalize accommodations for the journey’s first few days in Georgia. Paddle Georgia is regarded at the country’s largest week long canoe/kayak camping journey with 300 to 400 people participating each year. The purpose of the trip is to raise awareness of Georgia’s rivers and raise funds to protect those rivers. Proceeds from this year’s event will support Georgia River Network and Suwannee Riverkeeper / WWALS Watershed Coalition. Since its inception in 2005, GRN’s Paddle Georgia has introduced more than 4300 people to Georgia’s rivers while generating more than $430,000 for river protection. 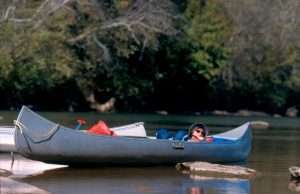 You’ve heard Alan Jackson’s song, now go paddle the section of river that inspired 1994’s Grammy-award winning “Chattahoochee.” Join Georgia River Network as we participate in Chattahoochee Riverkeeper’s 25th anniversary Relay Down the Hooch celebration. The 15-mile paddle route from Chattahoochee Bend State Park to Franklin takes in some of the best of the Chattahoochee shoals, rapids and islands downstream from Atlanta and will include stops at beautiful waterfalls on tributaries that spill into the river in Heard County. Along the way, Chattahoochee River User’s Guide author Joe Cook will regale you with tales of desperate Union soldiers escaping death along this section of river during the Civil War to mid-19th century logging operations at Bushhead Shoals Islands. You’ll be surprised at the beauty and adventure found on this forgotten and recently revived section of the river. This trip is mostly flatwater with several Class I shoals. Bring your own lunch and drinks. 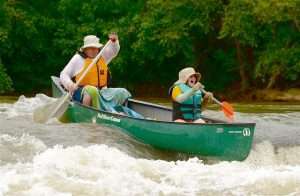 Boat rentals and shuttle service provided by Blue Heron Adventures in Whitesburg. Meet at Chattahoochee Bend State Park at 8am.